Implantable devices are called upon to serve a variety of functions, from vascular stents that preserve blood flow to electrostimulation devices that regulate heart rhythm or block spurious signals in the brain, to orthopedic devices that mechanically reinforce the spine or restore range of motion of hips and knees. For over a decade there has been an increasing convergence between implantable devices and drug therapies, including devices that deliver drugs as a primary of action. This article reviews some representative applications that materials and processes device designers can leverage in developing new products for these growing markets. Why implantable devices for drug delivery? Implantable drug delivery devices offer several advantages over conventional oral or parenteral dosage forms. First, implantable devices allow site specific drug administration where the drug is most needed. Examples include implants used in the treatment of brain tumors (Gliadel® wafer) or prostate cancer (Lupron® depot). This may also allow for significantly lower doses of drug which can minimize potential side effects. Second, implantable devices allow for sustained release of a therapeutic agent, as highlighted in the accompanying illustration (Figure 1). The last and perhaps most important advantage is patient compliance, as the treatment regimen associated with an implantable device is generally less burdensome than pills or injections. Figure 1: Idealized comparison of tissue drug levels for injections compared with an implantable drug delivery device. Clearance of the drug after an injection may result in significant time outside of the therapeutic window. Implantable drug pumps are used to deliver insulin in the treatment of diabetics and to administer pain medications directly to the spine (intrathecal pumps). These are typically programmable “active” devices which require regular resupply of the medication through an access port. Subcutaneous solid implants, conversely, provide long-term, “passive” release without the need for replenishment. Typically found as thin flexible rods or “matchsticks”, these delivery systems are particularly effective for the delivery of highly potent drugs such as hormones. Commercial examples include histrelin implants for the palliative treatment of prostate cancer and uterine fibroids(Vantas®), and early puberty in children(Supprelin®), levonorgestrel (Jadelle®) and etonogestrel (Implanon®) implants for family planning, and buprenorphine for the treatment of opioid addiction (pending FDA approval). Additional indications in development include subcutaneous implants for treatment of schizophrenia, breast cancer, photosensitivity, and Parkinson’s disease. A number of promising solid implant applications can be found in ophthalmology for the treatment of macular edema and retinal vein occlusion using corticosteroids (Osurdex®), with products in development for the treatment of glaucoma (prostaglandins) and age-related macular degeneration (anti-VEGF). In addition to subcutaneous implants, novel drug delivery forms such as intrauterine devices (IUDs) and intravaginal rings (IVRs) and are finding increasing applications in the area of women’s health. For more than two decades after serious safety issues were encountered with the Dalkon shield, no IUDs were marketed in the US. 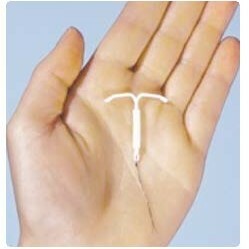 In 2000 the FDA approved a levonorgestrel eluting IUD (Mirena®) providing contraception for up to 5 years of use. Later, use of the device was expanded to include an indication for severe menstrual bleeding and a smaller device (Skyla®) has been approved for women who have not had children. IVRs are commercially available for contraception (Nuvaring®), hormone replacement therapy (Estring®), and to improve the rate of in vitro fertilization (in development). As with all implantable devices, key materials considerations for use in drug delivery include biocompatibility, stability and durability (except in the case of biodegradable drug delivery systems), and the ability of the material to control release of the active pharmaceutical ingredient (API). Silicones have long been a material of choice for drug delivery given their extreme chemical inertness, range of stable mechanical properties, and ability to compound various APIs within the matrix. The rate of release is generally proportional to the loading of drug within the silicone, typically 5-50% by weight. Ethylene vinyl acetate (EVA) is also finding use in drug delivery application due to the additional ability to control release rate by varying the vinyl acetate content. Like silicone, EVA is processed at relatively low temperatures, typically 150-250oF, which helps to minimize risks associated with degradation of the API. Polyurethanes and acrylate hydrogels have also been utilized in select applications. Another option is to use a biodegradable material such as poly(lactic-co-glycolic acid) or PLGA to controllable release the drug while essentially “dissolving away” by hydrolysis to produce lactic and glycolic acid. While clearly most developers exhibit a preference for materials with an established history of use in vivo, new materials for drug delivery remain an active field of research, including tyrosine-derived polycarbonates which have the added benefit of being inherently radiopaque. All of the above materials lend themselves to manufacturing processes based on molding or extrusion. 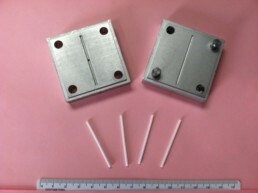 At ProMed, work has historically focused on molding silicone drug delivery devices using injection and compression molding techniques. Several factors must be considered in optimizing the material formulation and developing a robust molding or extrusion process. The material system (e.g. liquid silicone vs. high consistency rubber), mixing or compounding technique, API particulate size cure temperature, and pressure will all potentially affect the drug release consistency and drug content uniformity of a manufacturing lot. In some cases, co-extrusion or over molding of a thin, drug-free layer has been used to enable more uniform release of drug from the implant. Site-specific, controlled release of therapeutic agents represents an attractive option for companies looking to enhance the efficacy of an existing drug product or provide additional benefit in conjunction with an implantable device. A small but well-established pallet of durable and biodegradable polymeric materials provides options for delivery of potent compounds such as hormones, opioids, antibiotics, and oncology drugs. Well-established silicone rubber and plastic forming processes can be leveraged to make commercial volumes of devices with excellent consistency and reproducibility. Jim Arps is a Technical Director at ProMed Pharma, a company engaged in the molding of polymer-based drug releasing implants and combination device components. Working with both established and early-stage medical device and pharmaceutical companies, ProMed develops robust manufacturing processes and platforms for controlled release of therapeutic agents from a variety of materials. For questions please contact him by phone at 763-331-3817 or email at jim.arps@promedmolding.com.